WELCOME to St Mark’s Versailles. We are an English-speaking, international Anglican community situated on the outskirts of Versailles to the south-west of Paris. St Mark’s is a lively mix of people of many nationalities, denominations, languages and ages, united by God’s love for each of us. We welcome people of all kinds of Christian backgrounds, or none. Our main services take place at 10:30 on Sundays, followed by refreshments, cake and fellowship. We look forward to meeting you, whether you are just passing by or plan to stay a bit longer. See the Contact page for details of how to find us. 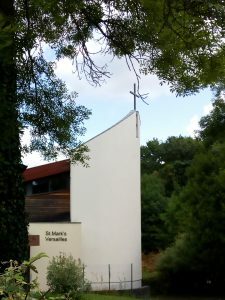 BIENVENUE à l’église St Mark de Versailles, communauté internationale basée au sud-ouest de Paris. Nous serions très heureux de vous accueillir, que vous soyez de passage à Versailles ou bien, installé(e) dans la région.